When You Wish Upon a Star | American University Washington D.C. Protesters outside the Uptown Theater in D.C. Photo credit: Ken Garrett. In the early 1990s, Disney was an entertainment powerhouse. During the so-called “Disney Renaissance,” the iconic company rolled off a string of box office smashes, including Beauty and the Beast and Aladdin. Euro Disney may have been struggling, but Disney already had well-established theme parks in Southern California and Florida. So there was little reason to think the company couldn’t build another park in the U.S. That assumption turned out to be wrong, as a citizen uprising derailed Disney’s plans for a new history theme park and a sizeable development project in Virginia. It’s all chronicled in a new documentary film, When Mickey Came to Town, which is set to premiere at American University on March 19 during the Environmental Film Festival. AU School of Communication professor Chris Palmer is co-executive producer, and SOC MFA student Sam Sheline is producer, director and co-writer. The film got financial backing and co-executive production from Prince Charitable Trusts, a group that helped spearhead the opposition to Disney’s park more than 20 years ago. The company planned to build its theme park, called “Disney’s America,” around Haymarket, Va., a tiny community in Prince William County. Beyond that, company officials had even more grandiose plans for hotels, townhouses, and a golf course. Yet Virginia residents raised concerns about the impact such development could have on the picturesque surrounding region, known as the Piedmont. Based on interviews for the film, Sheline says the initial resistance came from Piedmont landowners. In some ways, it was a “not in my backyard” reaction. Yet more citizens started to worry about congestion, air and water quality, and it soon became a regional issue. With hundreds of thousands of cars traveling to and from the park, the airshed—a geographic area where air is typically confined—could only handle so much pollution. “Maryland would have to actually cut down on its emissions to help compensate for the additional emissions in Virginia because of this,” says Sheline. Sheline believes that criticism from prominent historians turned this matter into a national controversy. The location was close to the Manassas battlefield—site of the Civil War’s Battle of Bull Run—and other historic towns and battle sites. Historians considered this hallowed ground, and big names such as David McCullough, Shelby Foote, and Ken Burns voiced their objections. In addition, the proposed content of the theme park raised all kinds of questions. There was talk of a simulated slavery exhibit and an Ellis Island exhibit, and Sheline points out the ethical quandaries this might have created. Teaching children about slavery and discrimination against immigrants requires extreme sensitivity and care. How would one do this in Disneyfied, family-friendly theme park attractions? Before pulling out in 1994, the Disney project was actually close to happening. Sheline says the state was prepared to commit millions of dollars in highway subsidies, and the VA governor’s office was on board. Yet the opposition forces, which included the Prince Charitable Trusts and the Piedmont Environmental Council, proved quite creative and resilient. Sheline says they swayed public opinion dramatically, with about three out of four people in the area eventually disapproving of the project. One key figure was Bill Backer, a successful New York advertising executive. Backer was the brainchild of the landmark “I’d Like to Buy the World a Coke” ad, recently depicted on the TV show Mad Men. A Piedmont-area resident, he had a personal stake in the fight, and he assisted with messaging and public relations. 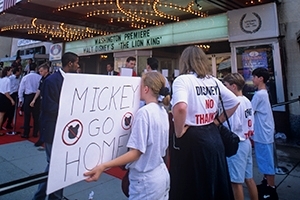 The campaign heated up, and protestors made signs that read "Disney Destroys" at the top, with a blank space below for protestors to personalize their complaints. Paul Oehlers, an associate professor of performing arts, produced music for the film. Adam Lee, a graduate student in film and video production, served as editor. Elizabeth Herzfeldt-Kamprath, a grad student and teaching/research assistant, was assistant editor. Matt Twiford, an adjunct professor and grad student in audio technology, worked on audio mixing and sound recording. The Disney campaign’s legacy extended well beyond the 1990s. As Sheline explains, it helped spur continued environmental activism in the region. “The Piedmont Environmental Council was just this sort of fledgling little organization during this Disney Park campaign. But now, it's a highly-regarded and much larger organization that protected a lot of land,” he says.